Simply, another wonderful week to be salmon fishing. Our rivers are in great shape with perfect water levels and temperatures. The fall colors are beginning to show and everyone's catching fish!, what more can we ask for. 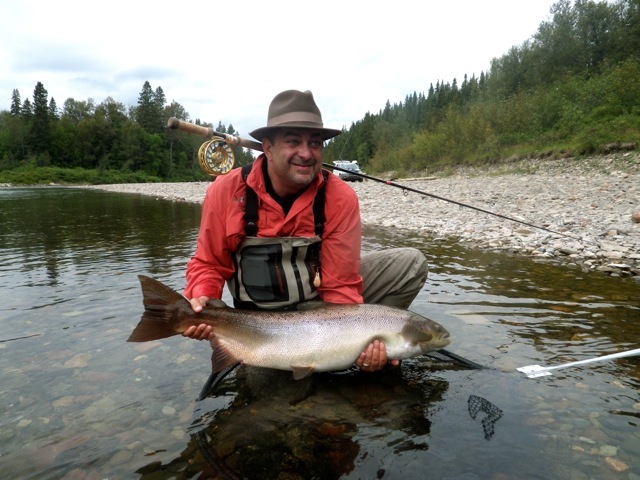 Fly Rod & Reel Magazine editor Greg Thomas releasing a nice September salmon back to the Grand Cascapedia. Nice one Greg! The new moon and high tide were on September 6th but we are still seeing plenty of fresh fall run salmon coming in on every tide. This week we'll see the full moon on the 19th and the high tides begin on Tuesday, should be good! Salmon Lodge regular Armando Pagliari caught this nice hen fish on his first pass through the pool, Nice fish Armando! We are still catching a good number of fish on free floating bombers, dry fly fishing is great when our water is in the 50 degree range. The Red Francis continues to be the fly of choice anlong with the GPand Alley Shrimp. Seems like anything with red or orange will do the job. Michael Blades from Halifax puts a nice fall run salmon back in the Bonaventure, nice bright one Michael! Salmon Lodge Guide Yvan Bernard helps Lydia Bugben of halifax release her first salmon. This was Lydia's first time fly fishing!